While there are a number of new diesel models for 2014, diesels are nothing new for Mercedes-Benz. 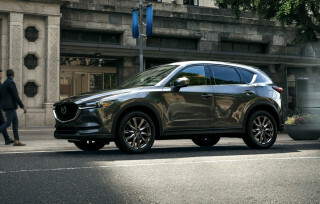 Yet at first blush, making the most fuel-efficient model in the lineup—the one that packs a new four-cylinder diesel—the entry point for mainstream luxury shoppers could be seen as a gamble. After driving the new 2014 E250 BlueTec, we'll say that it's much more likely a statement of confidence. This new-generation 2.1-liter in-line four-cylinder turbo-diesel engine in the E250 BlueTec is something to be proud of; it makes nearly the power (195 horsepower) and torque (369 lb-ft) as the previous 3.0-liter turbo-diesel V-6 in last year's E350 BlueTec. That diesel V-6 makes 210 hp and 398 lb-ft, respectively. Yet the E250 is expected to target 45 mpg highway—mileage that's far better than the outgoing E350 BlueTec model's 22 mpg city, 32 highway. 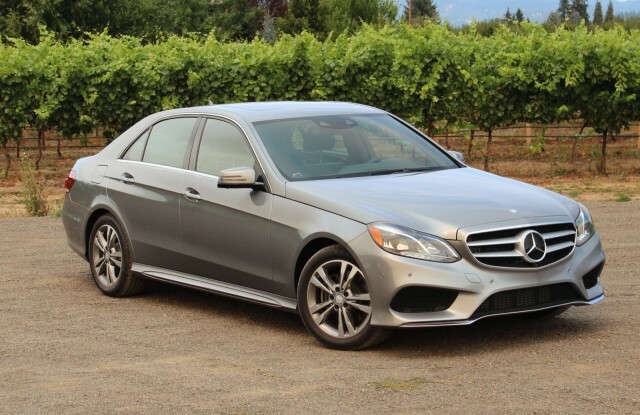 While the official EPA estimates aren't yet out for the E250 BlueTec, what we saw was promising. In about 60 miles of especially spirited driving—tapping into this engine's plentiful output to make several quick passes—we averaged 34.1 mpg. Then over another 120 miles, with more ups and downs, but at lower speed, we averaged nearly 38 mpg. Set the cruise, and those numbers will easily climb into the mid 40s. And this is with 4Matic all-wheel drive. Yes, these diesel models are now offered with a choice between rear-wheel drive (base $52,325) and 4Matic ($54,825). This new diesel is virtually the same as what's installed in the GLK250 BlueTec, but with the addition of Stop-Start, so that when it's at its peak operating temperature it smartly shuts off in gridlock or at traffic lights, to save fuel. The E-Class Sedan lineup, whether with BlueTec or not, gets a modest refresh for 2014, including new headlamps, some fresher sheetmetal and trim, and perhaps most notably, a choice now between Luxury and Sport models—with Luxury models having a traditional grille and hood ornament and Sport models getting the bolder grille, with integral three-pointed star, plus sportier trims throughout. Inside all the E-Class models, there's a new instrument cluster, plus a new design for the air vents as well as a center rectangular-framed analog clock. The steering-wheel now has a sportier flat-bottom look, with plenty of button shortcuts, as before, while the control set for COMAND has been supplemented with a few more buttons at the center console. Overall, our first impressions of the E250 were formed on some mostly straight stretches of highway. There, we found that it embodies everything that the entire E-Class family does, with no exception. It feels comfortable and supremely isolated from coarse pavement surfaces, and the new diesel has a pulsating, characteristically diesel thrum down low, developing into a low, throaty, even somewhat sporty sound when pressed hard. The seven-speed automatic is calibrated to make the most of the engine's torque and keep the revs low, almost lugging it along at low revs whenever possible and allowing a wide sweep of revs and a correspondingly broad swath of ratios. Even when you're accelerating lightly and the engine is turning at just 1,100 or 1,200 rpm, there's no clatter, no vibration, and no indication that the engine is at all unhappy in such an endeavor. There's definitely more of a pause, compared to a gasoline car, from the time you press quickly down on the accelerator—the consequence of trying to cram that much additional air and fuel into such a high-compression engine—but this is a diesel that's surprisingly responsive once underway. The second part of our BlueTec drive took us on some much curvier mountain roads; and here this E-Class felt far more lively than we expected; with less weight in the front, the E250 BlueTec is definitely more nimble than the former V-6 diesel—and much more coordinated in tight switchbacks. High performance driving simply doesn't feel like the sweet spot for this car. Fuel efficiency and top-notch cabin luxury are part of its sweet spot, as is technology. And one world-first technology that you can opt for in the 2014 E250 BlueTec i's especially useful. And shocking. Called Distronic with Steering Assist, this new system uses a combination of stereoscopic cameras plus radar sensors to actually take the reins and steer the car for short distances. When you engage Distronic here, an image of red hands on a steering wheel flashes on the instrument cluster, and the system, almost miraculously, follows gentle corners in the road and keeps you in your lane. Yes, the new E250 BlueTec is a gamble as a new base E-Class; but it could pay off as a market advantage. Mercedes-Benz has sold nearly 9,000 diesels so far this year (through July); that's roughly triple the amount sold by BMW, Porsche, or Audi (although of course not as many as VW). And kudos to that; now, those who happen to walk into a Mercedes-Benz dealership and take the most affordable E-Class out for a spin could end up with something very green. The new BlueTec models begin reaching dealerships next month. 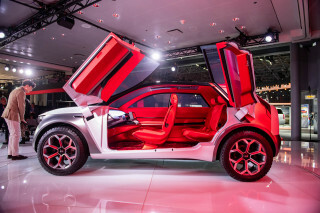 See the full review over at The Car Connection for more details. How To Find Diesel Fuel Anywhere In The U.S.